Medieval music sounds nothing like modern music. For the uninitiated, medieval music is not just Gregorian chant -- like that made popular by the Benedictine Monks of Santo Domingo de Silos. Chant does exhibit an almost trance-like quality, but it's the nature of the genre to only use about a half dozen notes and about as many different rhythmic patterns. Add to this the fact that there is no harmony, and you have a genre of music where every piece sounds almost exactly the same. So I'm more interested in instrumental music and medieval polyphony like organum. This music creates an amazing, transcendental atmosphere. I suppose part of the reason I like medieval music is because I'm absolutely fascinated with the medieval era; this naturally includes the music from this time period. I find that most people, even musicians and composers, have little or no interest in experiencing medieval music. So I suppose this is my attempt to win some converts, a sort of low-level overview of the music from a time that seems so far from, yet is so deeply engrained in Western culture. Basically, all early music can be divided into two general categories: sacred and secular. Christianity was a dominant part of medieval culture, so an entire musical style developed just to support it. Sacred music was therefore set to the text of the Bible or at least inspired by it. This meant it was necessary for composers of sacred music to have some sort of education, a rare commodity in those days. For those who did not have the musical training and Biblical literacy needing for composing sacred music, there was the less-sophisticated (but equally important) realm of secular music. 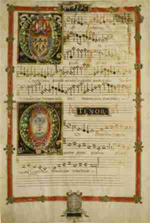 Medieval music manuscript. Click on image for larger view. Medieval secular music was usually passed along orally and very rarely written down, so little has survived. In fact, this is true of most folk music until the last century. Further, medieval musicians and composers didn't feel the need to stamp what works they did write down with their name, as would be unthinkable for any modern artist. So part of what secular music has survived from the middle ages is often anonymous. Often, at best, music scholars have pinned down the style of a piece to several composers and to within a decade or two. For those who do know a bit about medieval music, they usually think of the troubadours, trouveres, and minnesingers when they think of secular music. All were different names for essentially the same type of musician; poets first, and originally most likely just using the music as accompaniment. Because secular music's purpose was for entertainment, there was little drive to push its style to the edges during the early medieval times. 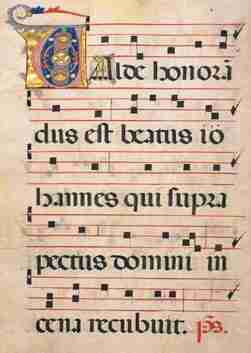 Therefore it was from sacred music, where the inspiration to please God was present, that medieval music truly evolved. 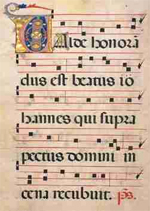 Medieval Antiphon manuscript page. Click on image for larger view. With the birth of Christianity came the Mass. At first, it was customary to simply read excerpts from the Bible. However, in the tradition of the Jewish culture, many parts of the Mass were chanted. It seems like a natural progression: a large group of people in an acoustically resonant structure (like an order of monks in a large church or cathedral) is reciting a prayer or a passage from the Bible, and then they start to hold their voices over some syllables. Maybe they let the tone of their voice rise or fall over that syllable for added effect. Regardless, it is easy to see that this was how plainchant, or Gregorian chant, came into existence. Since plainchant was a logical extension of a group of people reciting text, there were very few pitches and rhythmic variations used. This explains why plainchant has such an unusual and musically monotonous sound; it was simply one note at a time being sung by one person, for example a priest during Mass, or a group of persons, such as a choir of monks. It is key to recognize that plainchant has only one note being sung at a time, and is therefore completely melodic (with a very simple melody and rhythm at that) with absolutely no harmony. However, around the 12th century, particularly at the Cathedral of Notre Dame in Paris, sacred composers became restless with plainchant and began experimenting. 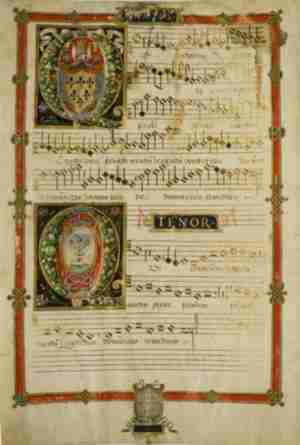 They started by adding the same note an octave higher or lower to notes of the plainchant. This doesn't really change the harmony, but it adds a richer texture to it. Then, they started adding this additional voice to the plainchant at the interval of a perfect fifth or fourth instead of just at the octave. Hence, the birth of organum, the first form of polyphony. Once the concept of adding other notes to a plainchant was realized, there was no stopping the possibilities that the newly discovered concept of harmony would allow. From this evolution, the major scared forms of medieval music were created: the medieval motet and pieces composed for the various parts of the ordinary and proper Mass.